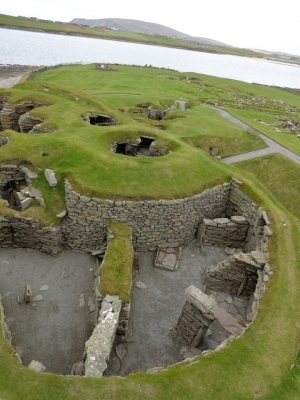 Mousa, Old Scatness and Jarlshof: the Zenith of Iron Age Shetland is part of the Tentative list of UK in order to qualify for inclusion in the World Heritage List. Three different sites make this TWHS. Two are easily accessible, south of Shetland Mainland along the main road to Sumburgh lighthouse, and under one-hour drive from Lerwick, the “capital” of Shetland. Jarlshof is the easiest site to visit; you will find there a small museum and basic information. When we visited in 2015, the entrance ticket for the site was part of the Orkney pass (good to know for those visiting Orkney islands before or after Shetland, as we did on our “tour of Scotland”). Most valuable remains are the iron age constructions with dry stones technique, but the site testifies of thousands years of human activities, including Viking evidences and ruin of a farm from seventeenth century. This is a quite compact site, laying in a nice location, immediately on the shore of the ocean. I read it can be crowded, but there were very few visitors on that morning on August 2015. The visit takes around one hour. Old Scatness is about 1 km north, on the way back to Lerwick, and immediately before crossing one of the Shetland airport tracks (when driving northwards). This site is attended only one day per week, but the small gate at the entrance is not locked and you can get on site without any difficulty. Remains here are iron age again, and some houses have been reconstructed. It is easy to combine this visit with Jarlshof. As there is no information available on site, it is better to go first to Jarlshof, although you will for sure pass along Old Scatness when driving from Lerwick to Jarlshof. Third and last component is the Mousa Broch. A broch is a round tower used as a stronghold for people from the Iron age. As says its name, this broch is on the small, uninhabited island of Mousa. It can be accessed via a small ferry, operating one daily (except Saturdays) round trip from April to September, when weather is fine (ie when wind is not too strong, and rain not too heavy). Departure pier is at the small village of Sandwick, a short drive off the road from Lerwick to Jarlshof. Unfortunately, during our three-day stay in Shetland, this tour never operated because of the wind, so we missed that visit. Other brochs (not part of any TWHS) can be visited, in Shetland (one is just out of Lerwick) and in Orkney also. Mousa broch is said to be the tallest of all remaining brochs. We had arrived in Shetland with the top-quality night ferry from Aberdeen, and left three days later with another ferry to Orkney, where we visited the Neolithic WHS, and spent another few days before returning to Mainland Scotland. We really enjoyed our time in Shetland, quiet and remote islands (birdwatching at Sumburgh Head and Saint Ninian double beach shall not be missed). Jarlshof and Old Scatness were interesting visits, although not breathtaking. Unesco has been inscribing pre historic sites without any difficulties over the last years. We found these Shetland sites more interesting and rewarding than, for example, Caves of the Ice age or Gorham cave that we visited since then.